Place a container in the freezer. Split the vanilla pod lengthways, scrape the seeds out with the point of the knife and tip into a pan with the milk, cream and pod. Bring to the boil, then remove from the heat and leave to infuse for at least 20 mins. For the best flavour, this can be done a few hours beforehand and left to go cold (see tips, below). In a large bowl, whisk the sugar and egg yolks together for a few minutes until they turn pale and fluffy. Put the vanilla cream back on the heat until it’s just about to boil. Stir in the cream cheese then carefully sieve the liquid onto the yolks, beating with the whisk until completely mixed. At this point, get a large bowl of iced water and sit a smaller bowl in it. Pour the custard back into the pan and cook on the lowest heat, stirring slowly and continuously, making sure the spoon touches the bottom of the pan, for about 10 mins until thickened (see rules, below). Strain the custard into the bowl sitting in the iced water and leave to cool, then churn until scoopable (see methods, below). 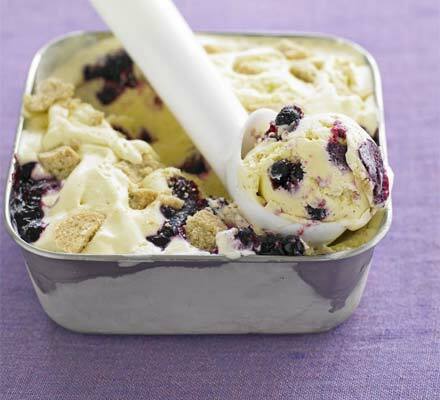 Sandwich layers of the ice cream in the container with large dollops of blackcurrant conserve and chunks of biscuit. Freeze until solid. 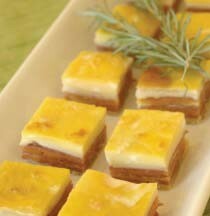 For the best flavour, infuse the vanilla in the milk and cream for a few hours if possible. Place the chilled custard in a plastic jug or tall freezer-proof container and put it in the freezer. When it’s slushy, blitz it with a hand blender. Repeat the process two more times and leave to freeze until scoopable. When making homemade custard, you need to cook it as slowly as possible and it must never boil. You are trying to cook the eggs without scrambling them, so put them on the lowest heat possible. You must also stir your custard continuously, making sure the wooden spoon comes into contact with the bottom and all corners of the pan. Simply pour in the cooled custard and churn until it’s frozen, then transfer it to a chilled container. Put your cooled mix in a metal bowl in the freezer. When it becomes slushy, whisk it hard. Place back in the freezer and repeat the process two more times, then leave to freeze until scoopable. Finally, transfer to a smaller container, adding chunks or ripples if you want. 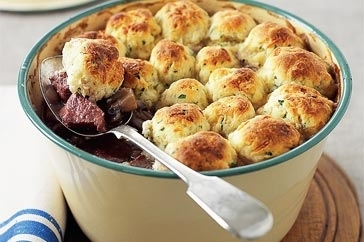 Warm up with this hearty casserole – a Taste.com.au member favourite! Brown 1kg gravy beef, cut into 2cm chunks, in 1 tbs olive oil over medium heat. Transfer to plate. Add 1 onion, chopped, 6 bacon rashes, chopped, 500g button mushrooms, halved, and 4 whole garlic cloves, peeled and cook until soft. Stir in 2 tbs plain flour. Add 2 cups (500ml) beef stock, 1 cup (250ml) red wine, 2 fresh thyme sprigs and 3 bay leaves. Bring to the boil. Reduce heat to low, add beef and simmer covered for 1 1/2 hours. Spoon into a 2 litre (8 cup) ovenproof dish. Preheat oven to 200°C. Rub 50g butter into 2 cups (300g) self-raising flour. Stir in 1/2 cup (45g) parmesan and 3/4 cup (185ml) milk. Bring together. Roll into 20 balls. Place on beef. Bake for 20 minutes. A sticky hoisin and honey sauce and a sprinkle of crunchy noodles are the secrets to this vegie-packed stir-fry. Place the rice in a large sieve. Rinse under cold running water for 15 seconds or until the water runs clear. Drain. Bring the water to the boil in a large saucepan over high heat. Stir in the rice. Cover and bring to the boil. Reduce heat to very low. Cook for 15 minutes. Set aside, covered, for 5 minutes. Use a fork to separate the grains. Meanwhile, heat a wok over high heat. Add 1 teaspoon of oil. Swirl to coat. Add one-third of the beef and stir-fry for 2 minutes. Transfer to a plate. Repeat, in 2 more batches, with remaining oil and beef, reheating the wok between batches. Heat remaining oil in wok. Add onion and reduce heat to medium-high. Stir-fry for 2 minutes or until soft. Add carrot, corn and beans. Stir-fry for 3 minutes. Add the extra water and stir-fry for 1 minute or until the water evaporates and the vegetables are tender crisp. Combine the soy sauce, hoisin sauce, lime juice and honey in a small bowl. Add the beef and soy sauce mixture to the wok and toss to combine. Divide the rice among serving bowls. 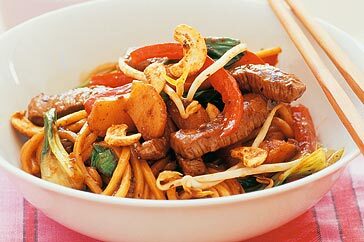 Top with the stir-fry and sprinkle with the noodles. Serve immediately. Cook’s tip: Stir the rice when you add it to the pan – this stops it clumping together. 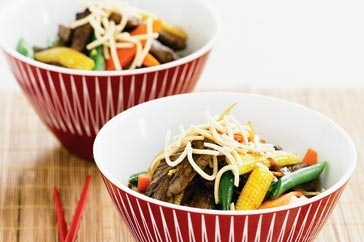 Have dinner on the table in no time with this tasty beef noodle stir fry. Place noodles in a large heatproof bowl. Cover with plenty of boiling water. Set aside for 3 minutes. Drain and separate. Heat wok over high heat. Once hot, add 1 tbs of the oil. Swirl the oil around the wok to coat the sides. Add half the beef and stir-fry for 1-2 minutes or until just cooked. Transfer to a plate. Repeat with the remaining beef. Reheat wok over high heat. Add capsicum and water chestnuts. Stir-fry for 1-2 minutes. Add bok choy and 1 tbs water. Cover and cook for 1 minute or until leaves start to wilt. Return beef to the wok with the noodles and black bean sauce. Toss for 1-2 minutes or until heated through and well combined. Remove from heat and toss in bean sprouts. Sprinkle with cashews and serve. 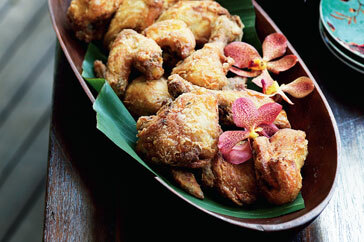 This twice-cooked chicken is juicy inside and crunchy on the outside. Rinse chicken inside and out under cold running water. Pat dry with paper towel. Place chicken, breast-side down, on a work surface. Use poultry shears or sharp kitchen scissors to cut along either side of the backbone. Discard the backbone. Cut the breast in half along the breastbone. Cut around the legs, between the thigh and breast. Cut drumsticks from the thighs. Cut the wings from the breasts. Cut each breast in half diagonally. Combine water, coconut milk, onion, garlic, bay leaves, lemon grass, sugar and turmeric in a large saucepan. Add the chicken. Bring to a simmer over medium-high heat. Reduce heat to medium and cook for 50 minutes or until chicken is cooked through. Transfer the chicken to a bowl. Set aside to cool. Discard the coconut milk mixture. Line a baking tray with paper towel. Place flour in a bowl. Season with salt and white pepper. Toss chicken in the flour to coat. Add enough oil to a large heavy-based saucepan to reach a depth of 10cm. Heat to 180°C over medium-high heat (when oil is ready a cube of bread turns golden-brown in 15 seconds). Add one-third of chicken. Cook for 4 minutes or until golden. Transfer to lined tray. Cook the remaining chicken, in 2 more batches, reheating oil between batches. 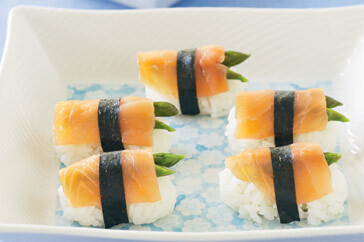 Now you can make our own sushi bites at home with this easy recipe using silky smoked salmon. You’ll need a bamboo sushi mat for rolling. Make basic sushi rice: Rinse and drain rice 3 times or until water runs clear. Place rice in a strainer. Drain for 10 minutes. Place rice and 1 cup cold water in a saucepan over medium heat. Cover and bring to the boil. Reduce heat to low. Simmer, covered, for 12 minutes or until rice has absorbed water. Remove from heat. Stand, covered, for 10 minutes. Transfer to a large ceramic dish. Stir rice with a plastic spatula to break up lumps. Gradually add seasoning while lifting and turning rice until rice is almost cold. Cook asparagus in a saucepan of boiling water for 1 minute or until tender. Rinse under cold water. Drain. Cut each asparagus spear in half crossways. Cut each nori sheet into 2cm-wide strips. Form tablespoons of rice into rectangular mounds with rounded edges. Top each mound with 2 pieces asparagus and 1 piece salmon to make 24 battleships. Wrap 1 nori strip around each. Serve. 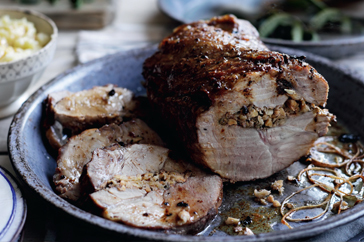 Barbecuing this nutty, apple-filled pork is not only easy, it takes the flavour to a new level. Preheat an enclosed barbecue to 200°C. 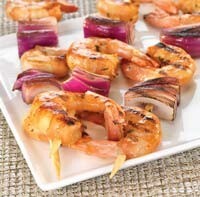 Place a wire rack in a roasting pan or foil barbecue tray. 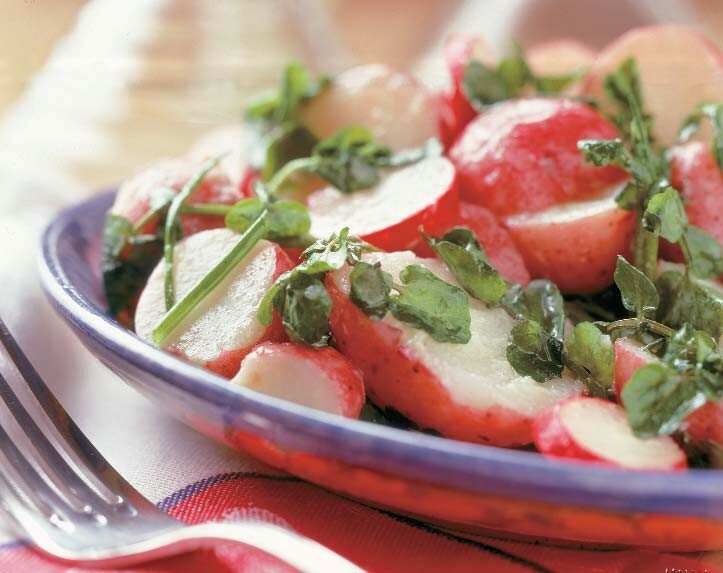 Combine the apple, hazelnut, mint and lemon rind in a small bowl. Use a long sharp knife to cut the pork horizontally (don’t cut all the way through). Open the pork to lie flat. Spread the apple mixture over half the pork. Roll up the pork to enclose the filling. Use unwaxed kitchen string to tie the pork at 2cm intervals. Insert a meat thermometer, if using. Place the pan or tray in the centre of the barbecue. Switch off the burners located under the pan or tray and switch the burners on either side to low. Close the barbecue. Roast for 1 1/2 hours or until just cooked through. Transfer to a plate and cover with foil. Set aside for 5 minutes to rest. Slice the pork and serve with mashed potato. Cook’s tip: Using the barbecue is a great way to avoid dry pork – its indirect heat helps keep large cuts of meat moist and tender. 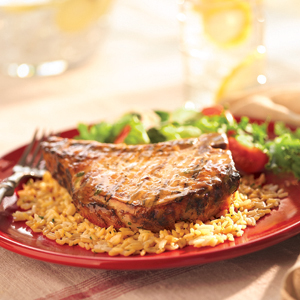 Plus, your pork dish becomes infused with a delicious smoky flavour. Getting started: For the best results, follow these barbecue roasting tips. Preheat your barbecue by turning on all the burners then closing the hood until the desired temperature is reached. Switch the burners to low to maintain the temperature. Turn off the burners directly under the tray, as this can overcook or burn the meat. Don’t lift the hood too often during cooking – this lets the heat escape and extends the cooking time.